What's New? Good Question!! Most of the last 6 years has been focused on helping to care for my elderly father and step-mother. 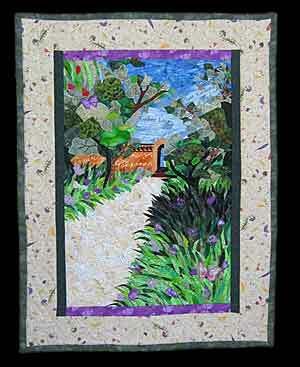 But I was able to finish a commissioned wall hanging recently; "Pathway of Peace", which was a pleasure to work on. Inspired by the beautiful walkway in the office park this will hang in, this fiber art piece has a new home in a mental health care provider's office in California. 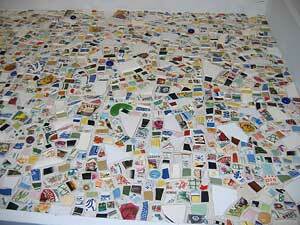 Teeny tiny pieces of many different fabrics were hand cut and assembled to form this collage style quilt. Comforting words such as Plant Kindness, Gather Love, Laughter, Beauty and Happiness are blended into the picture. For a closer look, visit "Pathway of Peace" page. If you are looking for a way to help out others with your creative talents or extra supplies, check out our list of over 150 organizations around the world that can use handmade items; knit, crochet, sew, quilt, etc. to help those in need. With the economic issues facing most communities, I believe warmth and comfort are needed more than ever. I am hoping this year to revamp/update some of this web site, but we shall see! Until then, I will be trying to update a page here and there when I can. Until I get a chance to post some more news, thanks for stopping by & Happy Quilting! New Mosaic Tile Pieces along with new fiber art pieces are in the Gallery Section.